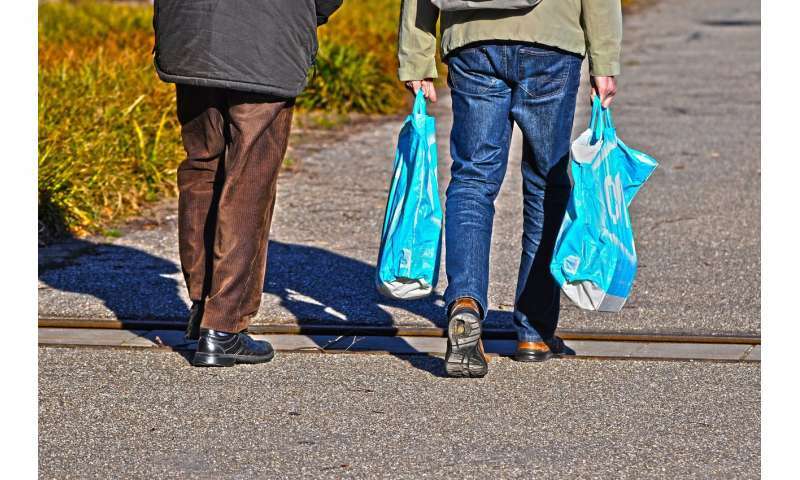 A team of researchers from the U.K. Austria and France has found that not enough work has been done to determine if biodegradable shopping bags are actually environmentally friendly. In their paper published in the journal Royal Society Open Science, the group describes their survey regarding biodegradable bag research efforts and what they found. As the public has become aware of the ecological harm of plastic shopping bags, scientists have begun looking for suitable replacements. The result, in many instances, has been biodegradable bags. These bags, it is assumed, break down in landfills or in the open environment, and thus cause no harm. But the team wondered if this was really the case. To find out, they conducted a survey and review of work done by researchers to test such bags. They report that not nearly enough research has been done to demonstrate whether the bags are harmless or not. Work done to find out if biodegradable bags hold up to claims, the researchers suggest, was not only inconsistent, but was often poorly defined. For their study, they looked only at work done to find out if and how biodegradable bags actually degrade among bags that make it to the ocean. They report that many such studies were conducted only in labs, not ocean settings, which offered limited results. They also found that there were no real rules that defined what biodegradable really means. Does a bag have to degrade in a few weeks or months to qualify, or can it take a few years? The researchers found there was no consensus. They report also that there were no standards in place regarding the chemicals left behind when a bag degrades—in most such cases, testing was only done to see if the bag broke down or not. The researchers suggest that not only is more testing required, but it needs to be done under real-world conditions. And standards need to be created that define biodegradability and whether the broken-down chemicals are causing harm to the environment. In one sense, plastics not breaking down is a boon, because it's one of the few carbon-carrying materials that don't degrade rapidly and thus gets sedimented and sequestered. It's like during the oxygen crisis, when trees and plants evolved lignin - which is a plastic - to stand up taller, with the added benefit that no fungus or rot living at that time could eat lignin and so the fallen trees took their carbon underground and caused oxygen levels to rise and CO2 levels to drop rapidly. Eventually, micro-organisms will evolve to eat all sorts of plastics as well, or we can engineer them to do it. The question is, do we want to, because all sorts of man-made structures would then be subject to rot.